WASHINGTON — The United Nations’ aviation arm overwhelmingly ratified an agreement Thursday to control global warming emissions from international airline flights, the first international climate-change pact to set limits on a single industry. The agreement, adopted at the International Civil Aviation Organization’s assembly meeting in Montreal, sets airlines’ carbon emissions in the year 2020 as the upper limit of what carriers are allowed to discharge without penalty. Airlines that exceed that limit in future years, as most are expected to do, will have to offset their emissions growth by buying carbon credits from other industries. The agreement is “a balanced, pragmatic, and very positive development,” said ICAO Director General Liu Fang, adding that it will “serve as an important new tool to complement the emissions reduction progress already being achieved” by airlines through technological innovations, modernized operations and growing use of alternative fuels. Countries must still act on their own to put the agreement’s limits into effect. Environmentalists complained the agreement was weakened by a last minute change that removed language that would have aligned its aims with a landmark climate-change accord reached in Paris last December. The first phase of the agreement, which is voluntary, covers 2021 to 2027. Participation becomes mandatory from 2028 through 2035. Some countries were still trying to decide whether to participate in the voluntary phase. The 15-year agreement is expected to reduce carbon that would otherwise be emitted by 2.5 billion tons, according to an Environmental Defense Fund calculation. That’s roughly equivalent to taking 35 million cars off the road every year for the life of the agreement, she said. Among the countries with significant international air traffic that have indicated they will participate in the voluntary phase are the United States, the United Arab Emirates, and Singapore. The European Union’s aviation conference, which includes 44 nations, has also indicated it intends to participate. However, Russia doesn’t currently plan to participate in the voluntary phase, and India expressed reservations with portions of the pact. The agreement has the backing of the airline industry even though it could cost airlines an estimated $5.3 billion annually in the early years and as much as $23.9 billion a year by 2035. 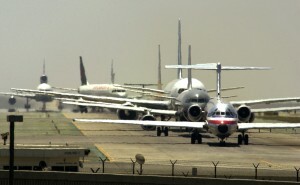 Airlines spent $181 billion on fuel last year. Airlines that keep their emissions down through more fuel efficient planes and aircraft operations will spend less on carbon credits. But since aviation is growing rapidly, emissions growth is expected to far outstrip increased efficiencies. The deal applies only to international flights, which account for about 60 percent of aviation. Emissions from domestic airline flights fall under the Paris climate change accord, which goes into effect next month. That accord commits rich and poor countries to take action to curb the rise in global temperatures that is melting glaciers, raising sea levels and shifting rainfall patterns. Governments must present national plans to reduce emissions to limit global temperature rise to well below 2 degrees Celsius (3.6 degrees Fahrenheit). Airlines that fly internationally were left out of the Paris accord because they protested that it would mean dealing with a patchwork of country-by-country regulations. The last minute change to the aviation emissions agreement stripped out language that would have aligned the agreement with the goal of keeping global warming below a 2 degree rise. “This deal was the world’s first opportunity to test whether the new Paris Agreement would change the way we do business and rally the world toward its new goals. Yet just hours after celebrating the Paris Agreement’s early entry into force, countries at ICAO are sending mixed signals about their ambition to reduce emissions by weakening the link between the aviation mechanism and the long term goals set in Paris,” said Lou Leonard, vice president of the World Wildlife Fund. Aviation accounts for less than 2 percent of the world’s carbon emissions. That may seem small, but if aviation were a country it would be the world’s seventh largest carbon emitter — larger than Canada or South Korea, but not as big as Germany. By the middle of the century, aviation emissions are expected to triple what they were in 2005. Airlines say they have already made significant changes. U.S. airlines, for example, carried 24 percent more passengers and cargo in 2015 than they did in 2000, while improving their fuel efficiency by 31 percent and emitting 6 percent less CO2, according to Airlines for America, a trade association for major carriers.